On the maiden voyage of the new 26-foot Yellowfin, Bill RIsso, Kenny Risso and Miles Iwasaki hooked and landed a blue marlin that bottomed out Heeia Kea's scale at 1150 lbs. Using the measurements of the fish, Capt. 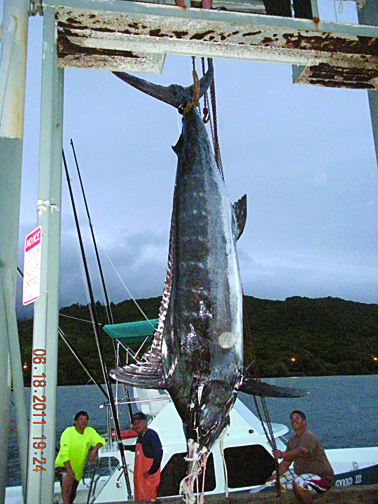 Russell Tanaka of the MAGIC determined that the likely weight of their monster marlin was 1236 lbs. They made their catch one day before Father's Day, 2011 off the Windward Coast of O'ahu.